Designed to fit behind the back seat cover. Some seats (Porsche) are open in the back and you can slide the bladder in. 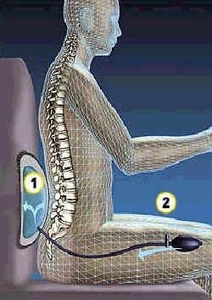 Other seats will require access either from the back or bottom to slide in the Air Bladder. Package includes 1 air bladder with attached tubing and 1 pump/bulbs with twist open/close valves. To eliminate any possibility of crimping the tubing in transit, the bulbs are shipped unattached. To attach to the tubing, simply wet the end of the tubing with some hot, soapy water and work the end of the bulb assembly into the tubing. When it cools, the tubing will make a tight seal.